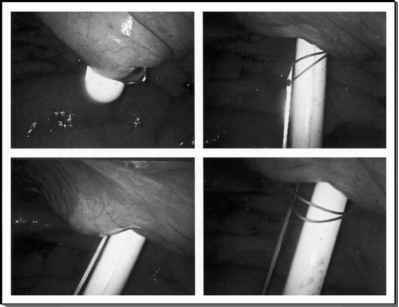 FIGURE 7 ■ Augmentation cecocystoplasty with formation of a continent catheterizable stoma. 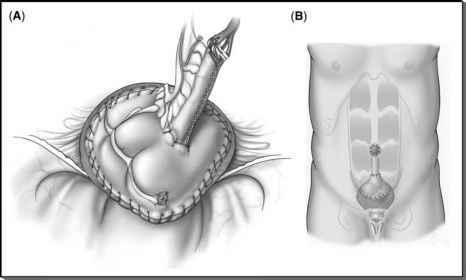 Complete view of the bowel to bladder anastomosis (A) in preparation for maturation of the catheterizable stoma to the umbilicus (B). Source: Courtesy of the Cleveland Clinic Foundation. Abbreviations: OR, Operating room; SUS, sensory urgency syndrome; MS, multiple sclerosis; SCI, spinal cord injury; SB, spina bifida; D, detrusor overactivity. notable was the absence of long-term or extended care needs for the patients with multiple sclerosis because of demands of wound healing or functional neurological loss that typically occur with an open procedure in this subset of patients. All patients have been evaluated with preoperative and postoperative questionnaires concerning bladder (bladder control scale; BLCS) and bowel control (bowel control scale; BWCS). Fourteen patients [2 (14.4%) male and 12 (85.6%) female; mean age, 40 years (range 18-62)] have completed at least the sixth month postoperative questionnaires based on a mean follow-up of 17 months (range, 7-27). With regard to the quality of life measure using the BLCS, there was significant clinical improvement. The average improvement revealed a significant reduction from the baseline score of 14.9 + 5.0 to 1.6 + 1.8, P = 0.0002. In regards to the potential risk of causing bowel dysfunction by harvesting various bowel segments for augmentation cystoplasty, there was no clinically significant difference in the bowel control score before or after the procedure when comparing the average change from 6.4 + 6.5 to 5.3 + 6.0, P = 0.30.